Take up the challenge of being a horse riding team leader! Nurture & train horses for varied competitions, including stunt riding. Build up your team & win the world championship! 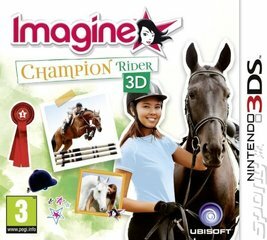 Experience riding in 3D, choosing between 16 realistic horses (eight breeds per two coats) and discover an amazing open environment in which you can ride freely. Compete in an exclusive discipline, from stunt riding to more traditional types such as jumping and dressage. Train and make sure your horses are ready to perform in the various challenges that could be thrown their way. You're not just stuck with the structured riding events, though. Enjoy varied free riding sessions - take part in tourist walks, track animals with your footprints book and enjoy treasure hunting! Players can build up unique relationships with horses, nurturing their own and helping others, too. Spend time with your horse to improve its performance and learn more about horses and disciplines in the Encyclopaedia! And why not personalise your riding adventure by customising accessories for your avatar and horses? You can stay connected with a number of features, including the option to link with Imagine Town, three Game to Web codes to unlock new uniforms and pieces of furniture, five Web to Game codes to unlock piece by piece a unique free-ride outfit and a streetpass feature that enables you to collect cards. Once youve collected enough you can access competitions or get a new horse for a free-ride session!